PS3 and PSP owners will get to help the Angry Birds get their eggs back, although not on quite as many levels as on other platforms. 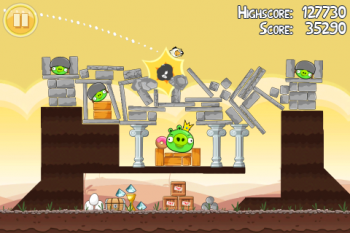 Angry Birds, one of the biggest iPhone games of 2010, is coming to the PS3 and PSP as a PlayStation Mini. This version will feature sixty-three levels, the same as the original release on the iPhone. The game puts the player in control of a flock of birds whose eggs have been stolen by a group of evil green pigs. In order to get them back, the birds fire themselves from a slingshot in an effort to break down the pigs makeshift structures and crush all the pigs. Each type of bird has a different ability, like breaking into three, smaller birds, or a sudden burst of speed, which maximizes its destructive potential. Presumably, the pigs are storing the eggs somewhere else, or else the birds plan seems slightly counter-productive. The iPhone version received a number of free updates, taking the total number of levels from the original 63, to a whopping 210. It does seems a little strange that whether developer Rovio Mobile would leave that content out, however, as it has no problem giving it away for free. It's possible that there's some reason that we don't know about - perhaps a file size limitation - that necessitated it. It's not clear whether Rovio plans to update the PSN version in the same way it did the iPhone. We've contacted the studio about the extra content, and will update if and when we get a reply. We've also asked about what this means for the planned XBLA version, as Microsoft has very strict rules regarding updates. We don't know how much the game will cost, either. The iPhone version is just 99 cents, but the PSN version will likely cost a little more, for quite a lot less content. Still, not every gamer has an iPhone or an Android phone, and 63 levels is still a pretty decent number, even if other platforms get a few more.